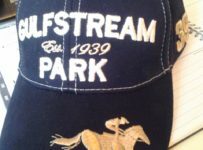 Prior to 11:00 a.m. Eastern Time today (Saturday), we will publish our recommended bets on the Belmont Stakes (Grade 1) for which scheduled post time is 6:37 p.m. Eastern. We will have our selections on our blog, which can be accessed on the menu bar at the top of the home page of this Web site. 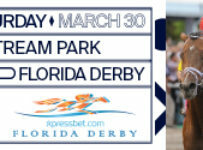 In addition, al of our coverage of today’s racing at Gulfstream Park, which is back on the turf, and at Belmont Park will be solely on our blog. 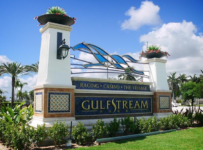 Gulfstream has a 12-race program, with first post at 12:55 p.m.
We will be at Gulfstream and we will monitor the undercard at Belmont Park with a focus on horses that raced this year at Gulfstream and/or at Tampa Bay Downs. 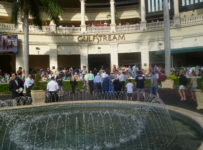 The Gulfstream card has no stakes races.Â But there is the big attraction of a Rainbow 6 carryover of $795,015. 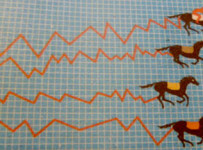 It is on the seventh through twelfth races. 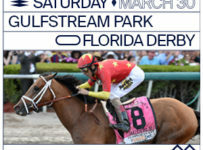 Six of the Gulfstream races are scheduled for turf. As of 7:54 a.m., five of those races are still set for the turf course that is listed as Good. 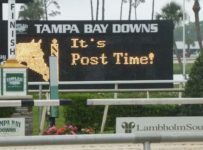 The dirt track is listed as Fast after being Sloppy each of the past three days. 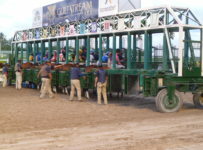 The first race on Saturday was scheduled for 7 ½ furlongs on turf. 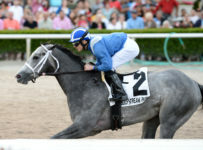 It has been moved to the dirt where it will be run at seven furlongs. 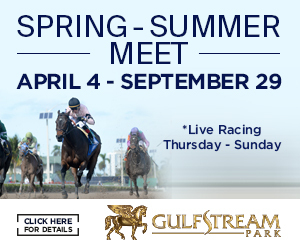 Races two, four, six and eleven remain scheduled for turf with the rail at 120 feet. 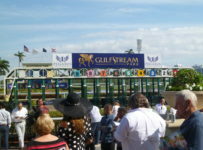 The 12th race is set for turf with the rail at 60 feet. We will provide updates on any changes. 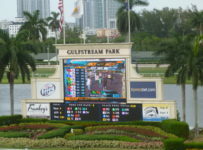 On Wednesday, Thursday and Friday this week Gulfstream moved at least some of its scheduled-for-turf races to dirt because of rain. Skies are cloudy around South Florida on Saturday morning. 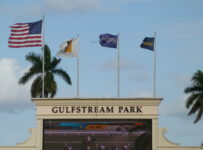 The Weather Channel forecast is for rain chances between 25 percent and 40 percent during racing hours in Hallandale Beach, Fla., where Gulfstream is located. The Weather Channel forecast is for a zero percent chance of rain in Elmont, N.Y., the location of Belmont Park. 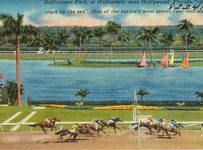 First post is 11:35 p.m. at Belmont Park for a 13-race card. The Belmont Stakes is the 11th race.